a massive undertaking to provide free resources to genealogists. Berkeley County is the second oldest county in West Virginia and was created (while part of the state of Virginia) in 1772 from the northern third of Frederick County, Virginia. The county seat was established in the colonial village of Martinsburg and was incorporated in 1778. During the Civil War, Berkeley County, still a part of Virginia, experienced conflict and much destruction, as did other areas, and families became divided. 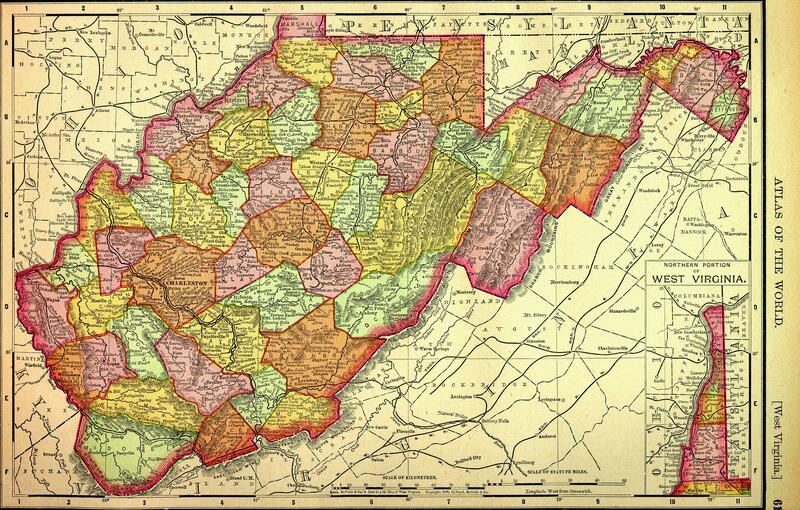 After November 1863, Berkeley County became part of the new state of West Virginia. Many Quakers and Scotch-Irish Presbyterians, along with the English and Dutch, became residents here in the early 1700s. The county has a long history and many historic and architectually important buildings. My name is Marilyn Gouge and I am the volunteer county coordinator for this site. It is always "under construction" and if you have any suggestions for, or comments about, this site, please feel free to contact me. I'm not an expert on Berkeley County and cannot respond personally to queries, but there are other excellent resources (scroll down the page for options), including the Berkeley County WV mailing list, message boards, and other links for research. If you have books or other materials and would be willing to do lookups for those out of the area, please contact me and I'll add you to the list of "Lookup Volunteers." Check back with us often since new information and links are added to this site frequently! This site is getting a facelift! There are many outdated links and there is new information available. So please bear with us as we perform badly needed updates. The Berkeley County WV Mailing List, hosted by RootsWeb, is for anyone with a genealogical interest in Berkeley County. To subscribe, send a plain-text email to: WVBERKEL-L-request@rootsweb.com with only the word subscribe in the body of the email. If you would prefer the digest mode (where messages are grouped together and sent out once a day), send your email to WVBERKEL-D-request@rootsweb.com. To post to either list, send a query to: WVBERKEL-L@rootsweb.com. Browse or search the archives of the mailing lists. This board will allow you to post queries and search for obituaries, bible entries, wills, and other information regarding Berkeley County folks and connect with others researching in the same area. Messages on the current board are those posted since mid-1998 and are fully searchable. Older queries are separate from the board and can be browsed through the following links. To respond to an individual query on the older boards, contact the poster of the message. WVGenWeb is not responsible for e-mail addresses that have been inactivated by the owners. Census Records — Coming Soon! Queries — Read what others have posted about their searches in Berkeley County — NEW! Birth and Death records since 1917; Marriage records since 1921; and Divorce records since 1968. Send to individual counties for records earlier than those years maintained by the state offices. Vital Research Records Search Selection — The Vital Research Records Project of the West Virginia State Archives is placing Birth, Death, and Marriage certificates on-line. Users can search the records and view scanned images of the original records. Not all of Berkeley County records are scanned, but do check back with theis site frequently since this is an ongoing project. West Virginia Birth and Death Certificates — West Virginia Health Statistics Center — Additional information on who can obtain birth and death certificates from the state. West Virginia State Archives — This site lists a number of repositories in Berkeley County, including itemized listings of some. It is recommended that you contact the individual repository for up-to-date information on their holdings. Links to individual repositories are provided if available. Otherwise, addresses and telephone numbers are listed on the West Virginia Archives and History pages. Berkeley County court records, Martinsburg. Itemized listing of birth, death, marriage, will, land and miscellaneous records, according to the West Virginia Archives. Please check with the county for complete information. Berkeley County Historical Society, Martinsburg. Itemized listing of some records available. Martinsburg — Berkeley County Public Library Itemized listing of some records available. North Berkeley Public Library, Falling Waters. Morgan Cabin, Bunker Hill — Colonel Morgan Morgan, the first white settler in West Virginia, built this cabin between 1731-34. The cabin was restored as a Bicentennial project in 1976, using many of its original logs. It is a historically furnished museum and is the home of the Morgan Cabin Committee. On Rt. 26, 3.5 miles West of Rt. 11. For times of operation or more information, call (304) 267-4713. Washington Heritage Trail, Martinsburg, West Virginia — Map and information about Martinsburg's nine historic districts: Baltimore & Ohio Roundhouse Complex; Belle Boyd House; Berkeley County Archives and Research Center; Berkeley County Courthouse; General Adam Stephen (founder of Martinsburg) House; Green Hill Cemetery Historic District; Summer-Ramer School; and The Triple Brick Museum. Handley Regional Library, Winchester, Virginia — has a collection of books pertaining to West Virginia and Berkeley County, WV. Frederick County, Virginia, GenWeb page. Since Berkeley County was formed from part of Frederick County, Virginia, in 1772, browse through this site to possibly locate information about your ancestors. Berkeley County Chamber of Commerce, Martinsburg. State of West Virginia The official state page. West Virginia Chronology - Visit a page maintained by Jeff Miller and browse around his other interesting pages, including "Some Interesting" Facts about West Virginia, including historical events. West Virginia Facts More facts and links about West Virginia. West Virginia Scenic Trails Get outside and enjoy the beauty. West Virginia Tourism Places and things to see and do throughout the state. West Virginia Travel Gateway to the Eastern Panhandle. If your ancestors traveled to West Virginia and settled in Berkeley Co., or were just passing through, you can honor them by placing their names in the Migrations database. All information that is submitted can be searched for by name or location so anyone will be able to find their ancestors and make a connection with you! To respond to those in the guestbook, send the poster an e-mail directly. I'm sorry if any of the e-mail addresses are not working. I am unable to change the email addresses within this guestbook. The guestbook is no longer available to submit queries. Your best choices would be the Rootsweb/Ancestry message boards and mailing lists (see above). An alternative would be the new Query page on this site — please see the Queries section above. If you have submitted an entry into this Guestbook and you would like to have it moved to the new Query page (particularly if you have a change of email address), please notify me. I can only delete entries from this guestbook. However, with the query system in place on this site, I will be able to make email address changes, as well as delete entries. I will not change the content of your message except to remove it or possibly to include punctuation to make the query more understandable. Thank you for your patience. Thanks & y'all come back!